But how does furniture impact flexibility and agility? The modern workplace is no longer static with endless rows of cookie cutter cubicles. Today, more than ever, companies want to harness the creativity and productivity that collaboration fosters. And they are doing it by taking down the proverbial walls. As blended work teams evolve they need furniture that supports efficient and nimble workflow. When basic needs are met, individuals within an organization tune-in to build, solve, and produce. Companies need furniture assets to create the framework for these agile and flexible work centers. Desks, tables and storage components should do double duty by creating sanctuaries for heads-down work and providing the flexibility to support team dialogue and brainstorming. When quantifying the value of a “flexible” and “agile” workspace, business decision makers must recognize what flexibility means to various stakeholders, and how flexible tools—in this case furniture—create long-term, lasting benefit to the individual, the team, and the company as a whole. Workplace observations show that high worker engagement positively influences task focus, creative problem solving, transparent communication, knowledge sharing, and long-term company loyalty. Granting individuals and teams the freedom to adapt their work environments is one way to foster this deep engagement. Freestanding height-adjustable, mobile, and non-handed furniture can help. Height-adjustability: Health and wellness is top of mind for many workers. Long hours at a fixed-height desk can lead to body strain and fatigue. The ability to change positions throughout the day has been proven to reduce tension and increase focus. A height-adjustable desk creates opportunity for instant strain relief without having to leave the task at hand. When you are physically comfortable, you are more likely to sink into deeper, meaningful focus. Increased focus leads to deeper insights, better use of time, and creative inspiration. Mobility: Compact and wheeled storage is a value-add to the individual. It can be tucked at home base and moved when teaming requires relocation or heavy work tools. Your mobile storage also makes rearranging your workspace a breeze. Shift your orientation to expand your view or gain a personal buffer and privacy. Adjustability: Employees can utilize adjustable privacy screens to increase division or engagement as work needs change. Screens also provide function by way of tackability or added white board surfaces for lists, notes and reminders. Larger furniture components including lockers and bookcases can also create semi-permanent space division. Freestanding: Untethered desks and tables allow both the facility and users to rearrange components to support more efficient workflow. For companies who are just starting out or prefer to centralize efforts, there is the option of reconfiguring workstations to create impromptu conference spaces. Do you have consultants coming in for an extended engagement? Extend your bench or desk run to create team cohesion. Big product launch? Reconfigure your space on the fly and make room for cross-functional stakeholders. 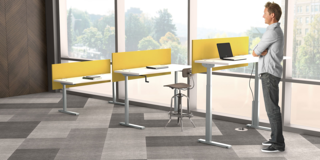 Mobility: Temporary transformation is made easy with castered tables, desks and storage. The ability to adjust the office layout from individual silos to a group environment or short-term workgroup clusters is beneficial for fast-paced and project driven teams. Time that would have been spent planning for a complex change can now be spent actively working on the business solution at hand. Free-standing, Height-adjustability, Mobility: User adjustability allows employees to adapt to their own needs without imposing on facilities. Gone is both the wait-time and need to inventory multiple parts for changing spaces. Casters make moving components around easy by reducing the physical burden that large furniture pieces might otherwise impose. For short term changes and mini workspace refreshes, the flexibility of freestanding, height-adjustable desks and mobile storage is a lasting value. Non-handed: Flexible, modular furniture can help streamline the process of employee turnover and movement. Truly non-handed components don’t stop with storage. Innovative surfaces are now available that allow you to turn a contoured right handed workstation into a left handed one without changing the footprint size. Just flip the surface and drop it right back into place. Non-handed and mobile storage components nest neatly in place. No need to house multiple surface types in anticipation of change. 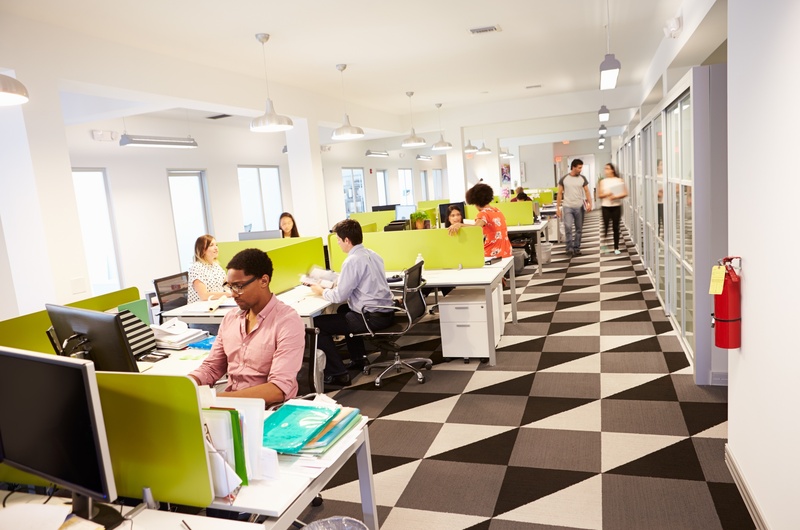 Durability: The more agile a workspace, the more durable the furniture needs to be. Lasting value is found in furniture built with no less than ¾” wood substrate on storage components and 1” wood substrates on surfaces. Additionally, steel reinforcement, metal-to-metal connections, industrial-rated casters and accessories, and scratch and dent resistant surface finishes increase the lasting value. While many manufacturers provide some of these attributes, fewer provide all. Is There Bottom-Line Gain From Investing in a New Desk? 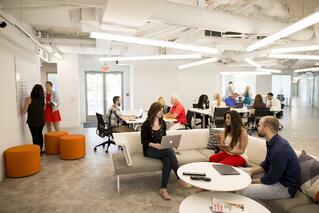 Office furniture can be leveraged to support contemporary and emerging work needs in the blended office ecosystem. 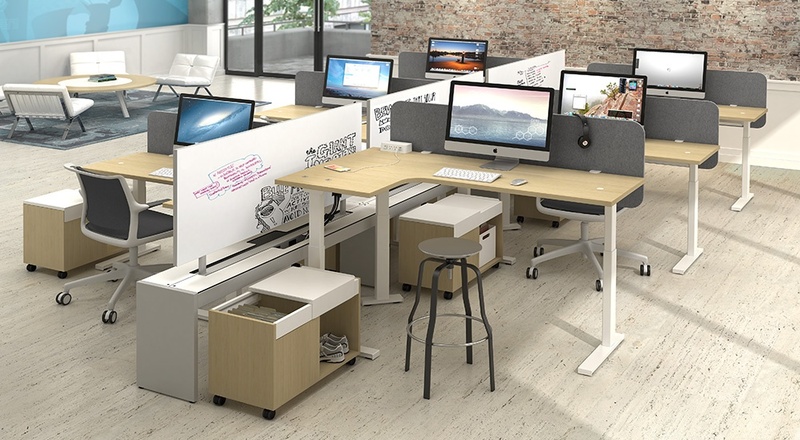 Dual-duty components including freestanding and mobile desks and tables create individual work zones and unite work teams. Allowing people the freedom to work flexibly helps them discover which environment is best for deep focus and which is stellar for creative clutches. In the agile workplace, adaptability is key. When a well-thought furniture plan is executed, the business benefits will be lasting. The goal is to make deliberate choices that drive change and support ongoing shifts. Reacting to change can be costly. investing in agile furniture assets support real-time change, reducing facilities management burden and downtime. “Agile” and “flexible” are attributes successful organizations build into their culture. When investing in your team, think of the furniture as one of the tools for success. Make your furniture something more than platforms and cubes that hold laptops and coffee mugs. Choose components that are freestanding height-adjustable, mobile and non-handed to encourage creative blending and to drive productive, bottom-line-supporting workflows.